Before you apply makeup to your face, you'll want to wash it and remove any excess oils or dirt. Use a gentle cleanser and wash your face with warm water and then pat it dry with a towel. If you are going to a party at night and have makeup on from the day, remove the makeup with makeup remover cloths or solutions before you wash your face. · You can leave your makeup on from earlier if you want or if you are short on time. However, your makeup will look best on a fresh face. Your makeup may look caked on or not as clean if you try to apply it over old makeup. But, if you don't have much time, wipe your face with a warm washcloth and remove your eye makeup if possible. Primer goes on before the rest of your makeup and helps your makeup last longer. If you are going to be up late, or at a party where there will be a lot of dancing, primer will prevent you from having to continually reapply your makeup. It also creates a more matte look on your face, which will remove any shininess. Apply a few small dots of primer across your forehead, nose, and cheeks and then blend it in with your fingers or a sponge. · A little goes a long way with primer -- don't apply too much as it's only supposed to be a light application. Try avoid the eye area as you will later apply an eyelid primer. Make sure you allow your moisturizer to dry before you apply your primer. · After you have applied your primer, let it sit for a few minutes before you apply your foundation. After your primer has dried, apply foundation to your skin, blending it in with a foam sponge, your fingers, or a foundation brush. Use a foundation that is suited for your skin type and try to choose a foundation that matches your color. If you aren't sure, first test it on your jawline and then look at your skin in the light, making sure the color blends in. · To adequately blend your foundation, start by applying foundation to the center points of your face (your forehead, nose, cheeks, and chin). 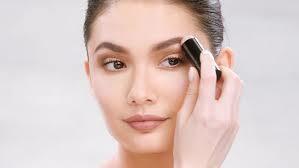 Then, blend the foundation outwards, going from the center of your face, to the outside of your face. · Make sure to compare the shade of your neck and jaw before you move onto the next step. You want the colors to blend together -- you don't want your face to be a different shade than your neck, so blend it in well. Step-5 Conceal blemishes or dark circles. Using a concealer that also matches your skin color, dab your blemish areas with a small dot of concealer. Then, blend it in softly with your middle finger. As you blend, you don't want to press too hard or blend it in too much as this can create redness or even remove the concealer. This is why using your middle finger is better, because with your index finger you may apply more pressure. · You can also highlight your eyes with concealer by applying it underneath your lower eyelid and blending it in just a little. You want these highlights to look natural, so blend your concealer in until you have a lighter area underneath your eyes. Step-6 Set your makeup with powder. Powder also helps your makeup stay, and keeps your face from looking extra oily. Use a powder brush and dip it into loose powder. Then gently swipe the powder across your face, blending it in by making small swirls with the brush. Finish using downward strokes. This will keep the tiny hairs on your face from being unnaturally squished in a weird direction. Make sure you choose a powder that also matches your skin color. Step-7 Apply bronzer to contour. To add a bit of color and contouring to your face, apply a bronzer one to two shades darker than your skin color. Use a sweeping motion with a brush across your face and create a three, starting at your forehead, moving to your cheeks, and then ending at your chin. The bronzer should be along your hairline/upper forehead, below your cheekbone, and just below your jawline. Blend it in with your brush. · If you have pale skin, you may want to skip the bronzer. However, don't be afraid to use a little bit of bronzer. You can follow the same steps, but use less bronzer as you don't want to darken up your face unnaturally. Bronzer will just help add some color and depth to your face. · Bronzer is often used for contouring, but it's usually used to simply warm a complexion. In order to fully explore contour, a shadow color is needed, such as a light brown or grey-brown color depending on your skin tone. The point of contouring is to play with the light and shadows of your face, so when darkening under the cheekbones to provide shadow, you'll want a color that will look just a few shades darker, like a real shadow on your face. · The fluffier the brush and the more blending you do, the better it looks so that you can achieve a more even tone. If you have any difficulties than you can just contact us or you can buy our service.